I have had dogs all my life and really got involved when I was 9 yrs. old. I started doing obedience when I was in high school and continued this for several years. 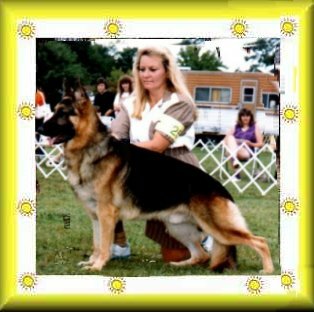 Then I started going to Conformation dogs shows and I was hooked! 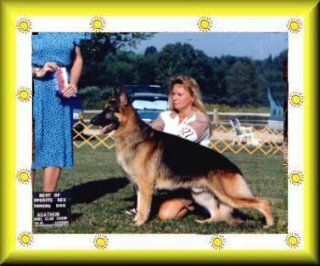 I bought my first show dog in 1985, but she didn't turn out for the show ring. I was at a show in 1988 and seen Jimmy Moses with his Special "BIS Ch. Bramblewood's Custom Made" I fell in love with this dog and contacted his breeder, Betsy Carpenter. She gave me names of breeders who had puppies out of "Conan". 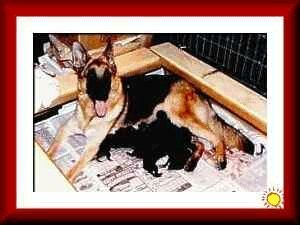 I received a video from Diane Schultz in Florida who had a litter she co-bred with Covy-Tucker Hills (my favorite breeders) The video had a brother and sister at the age of 4 months, this is the age that I found out I like to pick my own show puppies! I ended up buying the male, "Covy-Tucker Hill Hyclass Sun" Sunny! 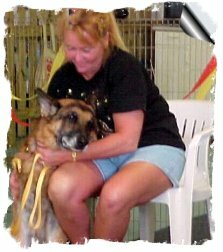 He turned out to be the dog of my dreams and we learned together what the world of dog shows is all about! 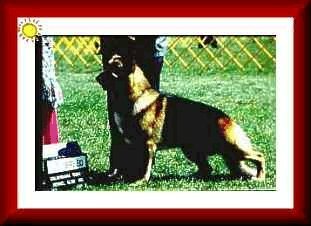 He had the show attitude that you want as a owner/handler. I showed him all the time and put 13 Points and a Major on him with several Major Reserves. "Sunny" is a one and only dog, he loves to play ball, go for rides in the van, jumps in bathtub for his bath!!! He will always be my "SUN SUN"!! The reason Sunny didn't finish his Championship is my fault. I'm a stubborn German and wanted to do it myself, I learned the hard way. Sorry "Sun-Sun", your a CHAMPION in my eyes!! About a year later I did get his sister "Bliss" whom was sold to the wrong kind of people (very sad) I still feel quilty I didn't buy her at that time too. "Sunny" and his sister, "Bliss", "Covy-Tucker Hill Hyclass Gem" are my foundation bloodlines. Please visit "BLISS" on her own web page, see below. They both have produced Champions and ROM Daughters. "Sunny" has two CHAMPION daughters, "Ch. 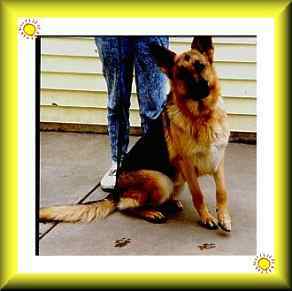 Von Charisma's Destiny OFA & "Ch. Kridler's Sweet Sunshine"OFA ROM. He also has several other progeny with Champion Points. Sunny also has two ROM daughters, "Sunshine" and "Kridler's Carpe Diem" ROM OFA. 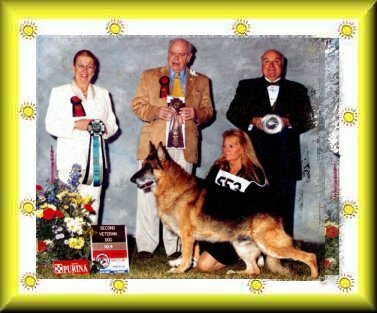 Sunny at the 2003 German Shepherd Nationals at 12 1/2 years old! This is Sunny at age 11 1/2 yrs. old!!! 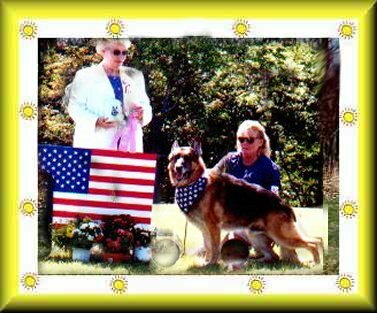 He is being show in the Veteran's class!!! "BIS Ch. Bramblewood's Custom Made OFA ROM"
I lost Sunny on June 11, 2004, it was a very sad day for me. 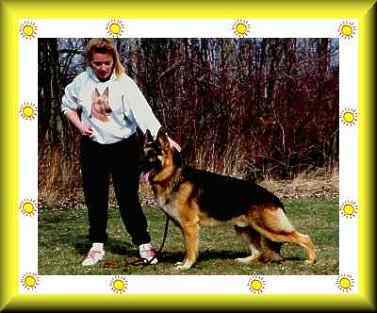 All pages are owned by Von Charisma's German Shepherds Do not ask for permission to use any of these graphics, they take hours of work and if you would like your pages done by Teresi's Web Design .